First priority At 877-Ducts-R-Us is to protect your property. 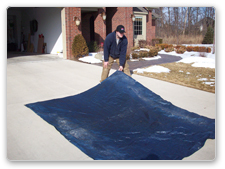 We start with a vinyl tarp on your driveway where our truck will park. This will prevent any dirt, oil or other substances from getting onto your driveway during the process. 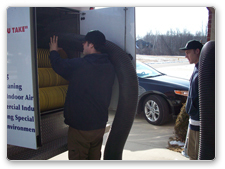 Our goal is to remove all the dirt that we dislodge and get it out of your home. 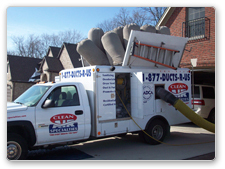 Ducts-R-Us trucks are among the most powerful systems available for duct cleaning. 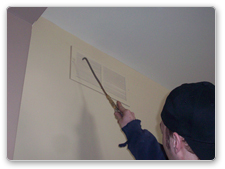 Trained to NADCA standards our technicians use the best cleaning methods to insure you get a well cleaned system. 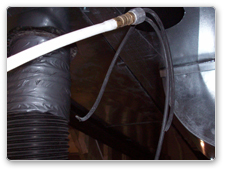 All of the techs at Duct-R-Us are certified by NADCA as Ventilation Maitenance Technicians. 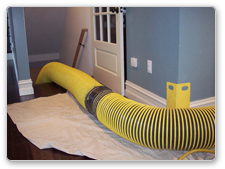 The vacuum hose is attached to both the supply and return main trunk line to put the system under negative pressure to insure dirt removal. Access points are cut in your main return and supply lines for dirt removal. These are later covered with hemmed sheet metal patches. 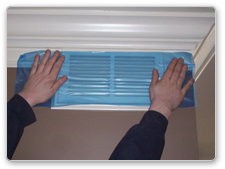 To insure maximum negative pressure in your system we cover your vent openings during the cleaning process with tape mask or magnetic covers. As we clean each branch run we systematically remove the mask covering to allow for proper cleaning and suction power. 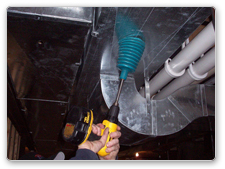 While your system is under negative vacuum pressure, we insert air powered scrubbing tools to dislodge the dirt from the inside of your ducts. As the dirt comes loose it is sucked out of your ducts and into our truck. 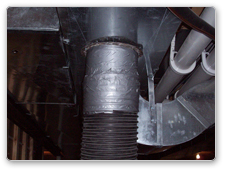 The return side of the system holds the majority of the dirt so we spend more time on this portion of your duct system. We clean all the branch runs and then move to the main trunk line. 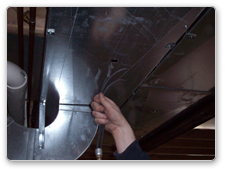 All trunk lines and plenum areas are also scrubbed with our special tools. 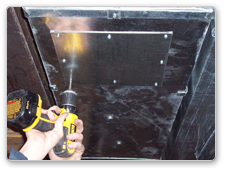 Plastic duct plugs are used to plug the tool entrance holes after the job is complete. Your system cleaning is completed with the furnace. 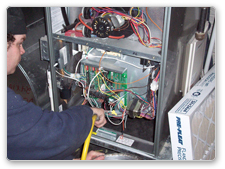 We use negative pressure and air tools to clean the burner chamber, blower chamber, heat exchanger and vestibule. All access points are covered with hemmed sheet metal covers and the tool access holes are plugged with air tight duct plugs. We then remove all our equipment and review the completed job with you.